It is critical to keep your timing belt system in good operating condition. Neglecting the timing belt, allowing it to break, may cause major problems with your engine. Symptoms of a failing timing belt may include a rough idle, hard starting, a backfiring condition dieseling (when an engine continues to run after the ignition is shut off), loss of power, fast funny idle and more. The recommended interval for timing belt replacement varies between 60,000 and 120,000 miles depending upon the year and engine size of the vehicle. When it becomes necessary for a timing belt replacement our technicians follow the vehicle manufacturer’s factory recommendations which includes also replacing the idler roller, tensioner roller, water pump, thermostat, and accessory drive belt. Timing belt replacement due to normal wear is preventative care and far less costly than replacing engine components or even an engine. Refer to the chart below for the manufacturers recommended replacement interval. Call us today for a free estimate. (1) – Manufacturer does not recommend a specific maintenance interval. (12) – On 2000-2006 models, inspect at 60,000, 80,000 & 100,000 miles, replace timing belt & tensioner every 105,000 miles. On all other models, manufacturer does not recommend a specific maintenance interval. (16) – On 1997-1998 models, inspect every 10,000 miles, replace timing belt & tensioner every 60,000 miles. On 1999 1.9L TDI engines, inspect every 10,000 miles, replace every 40,000 miles. On 2000-2001 1.9L TDI engine, with automatic transmission, replace timing belt every 40,000 miles. On 2000-2001 1.9L TDI engine, with manual transmission, replace timing belt every 60,000 miles. On 2000-2001 1.9L all TDI engines, replace timing belt every 105,000 miles. On 2002 models, replace timing belt & tensioner at 80,000 mile intervals. On 2003-2006 models, replace timing belt & tensioner at 100,000 mile intervals. 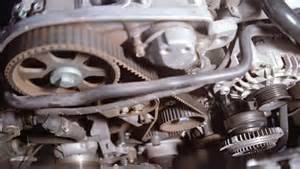 (22) – On 1999 models, replace timing belt & tensioner every 90,000 miles. On 2000-2006 models, replace timing belt & tensioner every 105,000 miles. On all other models, the manufacturer does not recommend a specific maintenance interval.